So if hundreds of applications are available in the Android Market, how can you find the one that's right for you? As with most things Android, you have choices. 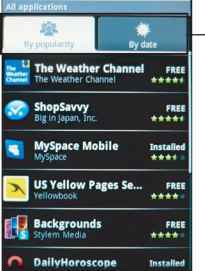 You can find an app in more than one way, just as there are so many different types of apps available. 1. From the applications menu, select the Android Market icon. 2. You're taken to the Android Market (see Figure 9.1). From here, you can select Applications, Games, Search, or My Downloads. At the Android Market, you'll find both games and productivity applications for your Android-based device. 3. Select Applications to go to a list of the different categories of applications. These categories range from Communications and Entertainment to Reference and Shopping. 4. Select Games to see a list of game categories that includes Arcade & Action, Brain & Puzzle, Cards & Casino, and Casual. 5. Select Search to open a search window. Then type in the name of the application you're trying to find. 6. Browse the available applications in the subcategory of search results until you find an application that interests you. You can touch the title of any application to move to an information page, such as the one shown in Figure 9.2, where you'll find a description of the application along with user ratings and feedback for the application. Download buttons also appear on this page, but we come back to those in the next section. The app turns phone into a flute. Hold key and blow the mic to play. Two octaves supported. Tap the title of any application or game to learn more about it and to see how other Android users rate it. As you're browsing the applications, you'll also notice two tabs at the top of the application listings page, as shown in Figure 9.3. This enables you to further sort the applications By Popularity and By Date. When you sort applications by popularity, the applications with the most stars appear at the top of the list, progressing down to the applications with the fewest stars. You can join in by rating these applications, too. Sort applications by popularity or date. 1. Touch the title of the application that you want to rate or comment on. This opens an information page similar to the one shown in Figure 9.4. 2. To add a star rating, touch the stars next to My Rating. This opens a Rate It window, as shown in Figure 9.5. 3. Touch the number of stars that you want to give the application. Then touch OK to save the rating and return to the information page. You can also touch Cancel if you change your mind and decide not to rate the application. Write anything you want with this app. Set a reminder based on your note, send your note by SMS or email. You can stick a note on your home screen for easy access. You can also customize the notes appearance and also sort or search notes by title. the notes appearance and also sort or search notes by title. On the information page, you can rate and review applications, but you'll also see information about the application and the number of downloads and ratings. Choose the number of stars you want to give an application, from one (worst) to five (best). 4. Back on the information page, a Post a Comment link appears directly beneath the star rating. Touch this to open a dialog box where you can type your comment (see Figure 9.6). 5. After you've entered your comment, touch the OK button to save the comment. If you change your mind, you can always touch Cancel to return to the information page without leaving a comment. 6. When you're finished rating and reviewing the application, you can press the Home button to return to the Home screen. Your ratings and review are automatically saved to an online server so other Android Market users can see them. Type the comment you want to appear in the Android Market for the application you've downloaded. 1. Open the information page for an application that you previously reviewed. 2. Press the Menu key to open a menu of additional options. 3. Touch More on the menu. This opens another menu, with two more options. 4. Select Clear My Review to remove both the star rating that you assigned the application and the comments you made. You might have noticed additional options when you opened the menu from the information page. Those options are pretty self-explanatory, but you might want to know more about two: Security Permissions and Flag Content. The Security Permissions option takes you to a page that explains what other applications and information the application has access to (see Figure 9.7). Most applications work with other applications, with your personal information, or perhaps even with the hardware controls on the device. This list tells you exactly what other access the application has. Most applications work with other applications, data, or hardware on your device. This screen lists the partnerships the application makes with those other resources. The second option, Flag Content, is an option that enables you to flag objectionable content. When you choose this option, a new screen, similar to the one shown in Figure 9.8, appears. Four options are available. Although Android Market is an open marketplace, developers are required to adhere to certain guidelines. You can find these guidelines at www.google. com/mobile/android/market-policies.html. If you find that an application doesn't meet these guidelines and want to report it as objectionable, touch the appropriate option and then touch Submit. The report is filed with the Android Market, and the application is reviewed. However, the folks at Android aren't promising that they'll remove the application—they promise only to "take action if appropriate." If you find applications that contain objectionable content or that don't adhere to Android guidelines, you can submit them for review. With so many applications to choose from, you'll probably want to install plenty of them. Installation is a simple process. When you're reviewing the information about the application, you'll see an Install button at the bottom of the screen (see Figure 9.2): Touch the button to install the app. A new page appears that shows you the list of information and resources the application requires access to. If you touch the Show All button on the screen, you open a list of additional resources that are used (if there are additional resources). Review the list; if you agree to allow the application access to those resources, touch OK.
Now all you have to do is wait. The length of time it takes to download and install the application varies by the application's size and by the speed of the network you're connected to. Most download and installation processes don't last more than three to five minutes, and the whole process takes place in the background.